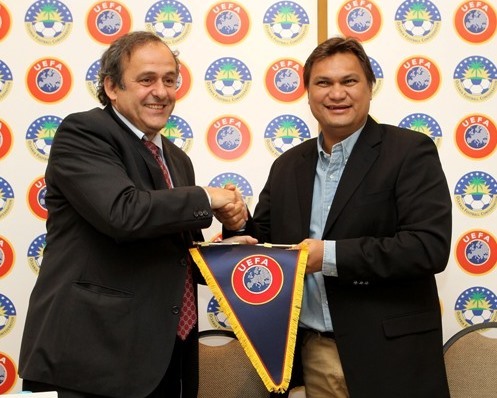 OFC President Reynald Temarii and his UEFA counterpart put pen to paper on a memorandum of understanding that aims to use football as a tool for education, as well as promoting healthy lifestyles for young people across the Pacific region. The focus of the understanding is the OFC Just Play programme, a unique grassroots initiative which promotes physical activity for primary school-aged children while encouraging community involvement and healthy living. Just Play is designed for children aged from 6 to 12 and is based around structured activity programmes. It also includes the distribution of equipment packs containing balls, cones, bibs, activity manuals and other resources that enable children to play football. President Platini has pledged UEFA’s support to the programme until July 2011 and agreed to supply approximately NZ$1 million. The agreement may be renewed every two years, depending on the progress of the programme. OFC President Temarii is delighted to have gained the backing of UEFA. There are a lot of social issues facing our young people in the Pacific such as obesity, illiteracy and leaving school at an early age. It makes sense therefore to use the popularity of football as a tool to combat these problems, he says. OFC would like to thank UEFA and in particular the UEFA President for believing in our Just Play programme. Their support, added to that provided by ministries of education, schools, teachers and the OFC member associations, will help to ensure its success. UEFA President Platini is very impressed with Just Play and congratulated OFC on the work it has done to get the initiative up and running. The programme has already been launched in Tahiti, Tonga, Vanuatu, the Solomon Islands and south Auckland and another nine countries are on the list. The nations set to benefit within the next two years are: American Samoa, the Cook Islands, Fiji, New Caledonia, Papua New Guinea, Samoa, Kiribati, Tuvalu and Niue. Just Play is led by OFC head of social responsibility Franck Castillo, technical coordinator Colin Tuaa and consultant Vania Kenning.